"Rebirth and Emergence of the New"
New Orleans poet Dave Brinks is editor of YAWP: a Journal of Art & Poetry, publisher of Trembling Pillow Press, founder of the New Orleans School for the Imagination, and author of The Caveat Onus: Compete Poem Cycle (Black Widow Press, June 2009). Anderson: I have this sense when I talk to you, that you feel this is the place where the new is emerging. Do you feel within New Orleans there is a rebirth in arts taking place? Brinks: Well it's always been the place that hasn't been so busy not to be able to do this. I mean for instance, in San Francisco in the 50's and 60's, it wasn't so busy. A lot of things could happen in Aquatic Park, where a musician and a poet could sit down, or Bob Kaufman could climb up on top of a table at The Bagel Shop and start annunciating great words that he thought people might want to hear, or maybe not. [laughter] This place is sort of just absolutely set up for that now. I say that in good measure of having been to, you know, not to sound silly, I've traveled everywhere except Alaska and Hawaii, even to the places that don't have people like the Black Hills or the Sequoia National Forest. To me, it seems like whatever is embodied in the people in the city of New Orleans, it's the same magic of that stand of trees, and same magic of the Painted Desert, and same magic of the absolute rush of energy flying off the falls at Niagra. It's the same energy that, you know, if you just sit in La Jolla and look out over the horizon, the great expanse of water, all of those things to me, that sort of richness of natural being, seems like the very fabric of what New Orleans is, in the composition of its people. Now, I don't know how or why that is, maybe no one will ever know how or why that is, but uh, it's not an illusion. [laughter] There's a thing that New Orleanians say, which is not correct. We always say, "The City that care forgot," and it's one of those things that has just gotten turned into something else. There's a plaque in Carousel Gardens in City Park right in front of the carousel and it tells you "The City where you forget your cares." This plaque was erected when my mom was just a little kid. They used to play in the little swimming pool there. Anderson: It just got flipped around. Brinks: Right, it was the place where you'd come to forget your worries. Anderson: Let's talk a bit about The Caveat Onus. The Caveat Onus is a cycle of poems composed in thirteen sections, (originally) published in four volumes by Lavender Ink (now reissued as one complete volume by Black Widow Press June 2009). The first three volumes contain four sections each and the fourth volume, the Coda, has the thirteenth and final section. In the Owl, Hawk and Rabbit sections, which are the last sections of books one, two and three respectively, the lines from the three sections that precede them are reused to make up the poems in these final sections. Thinking about the reversal of something like "The City where you forget your cares," into "The City that care forgot," may be useful here; because the lines that make up the poems in the Owl, Hawk and Rabbit sections still carry with them a weight of meaning from their use in previous poems. At the same time these lines are invested with new meaning in these new poems that make up the final sections. They undergo a reversal. Can you talk a bit about the construction of these book ending sections. Brinks: I started writing the book before the storm one day (Dec 2004), I don't know where I was walking, and in my ear I heard Caveat Onus; and I knew this was a book that I had to write. I know it sounds really weird and bizarre, but that's exactly what happened, this happens to me all the time. My mind is always open to all these possibilities, and so when I'm writing the book and the Caveat Onus thing comes into my head, I'm like okay. Well, I just followed it, and then it stopped writing, and then it started coming around again (Oct 2005). I knew I was going to write a book which would be comprised of thirteen sections; and that each meditation would be thirteen lines, and each section would contain thirteen meditations. Then I realized this also paralleled the Mayan Calendar, so I stayed honest with that, arranging each section in accordance with the totem animals of the Maya, and so I knew that's where I was headed with that. Also, I'd already been studying the great Taoist and Chinese poets and Japanese poets from Lao Tzu and Li Po and Basho, and the I Ching is another important part of the structure of the Caveat Onus, so there was that compass of the hexagram. All of these things are sort of underpinnings to the book. And while I was writing the first book, I knew the first three sections would write themselves; and then I knew the fourth section was going to be a collision. I knew that that's exactly how I was going to do it; because I knew that once I got to the fourth section I was going to combine... just take lines exactly as they are, and then they were going to come together in the fourth section. So what did I do when that day came? 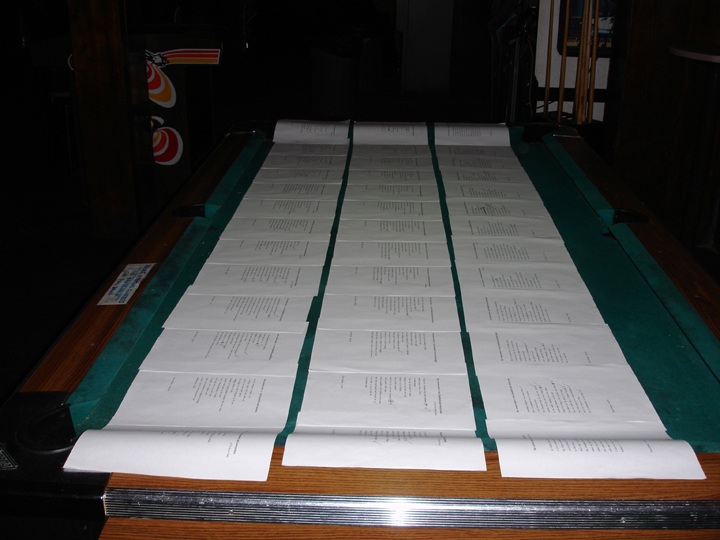 I laid the poems out in three columns lengthwise on a pool table at the Gold Mine Saloon, thirteen poems in each column, all three sections of Book One. And I said okay now I have to write the last section. So I got out a clipboard with a bunch of paper and a pen, and you know, I trust the mind apparatus moving cognitively and quickly sort of before it has time to think; and this might sound crazy, but the way that Cuttlefish [use] rapid fire pigments of color and patterns, way beyond fight or flight, it's like they're communicating these amazing things through this huge enormous rapidity of pigmentations and patterns. So I decided I was going to operate this way too. I'm going to look at things, and write them down as fast as I can; and the only thing I could call it is sub-microsecond context switching. Think about it in these terms: if we're only using 10 percent of our brain, my one rule of thumb is then we must probably be 90 percent wrong about everything else. So there's this amazing space that you can sort of pull into the creation of something. Anderson: Is there supposed to be an actual progression of time in these poems? Are they following the year's cycle? Brinks: There is a chronology in that way to it, but in the sense that time and space have been shattered, so it's the chronology of time and space being shattered; and the time lapse of it is actually the whole thing falling apart in one second, but over the course of time... of real time; so it's that whole sort of falling apartness of something over the course of time. Anderson: You do and have done a lot of work with the community in mind. For instance you're publishing Yawp: a Journal of Poetry & Art and you started the New Orleans School for the Imagination. Now there's the New Orleans Artists' Guild of which you're a founding member, and you run 17 Poets! Literary & Performance Series on a weekly basis at the Gold Mine Saloon. How are you able to balance these things and write as well? Is your work within the community a necessary part of your work as a whole? Brinks: On a specific level, where we are right now in New Orleans, it has this kind of beautiful shining kaleidoscopic space of smells, of architecture, of sounds and a huge vast array of words that are sort of just belching themselves up out of the streets. In my opinion, it's always been that way. So, just to sort of calibrate my breath and thinking in terms of that, gives me the compass that I need, to know what I'd like to do. I always think if I could get, whether it's a poetry reading or a group art hanging or a workshop, if we could get, you know, one one-hundredth of what we're about, and transmit that how literally utterly powerful that is. So we've got to make sure that transmission gets through. And how do you do that? You make sure that the environs are open enough to be a conduit for that, for those things to come through very clearly, unmistakably, and with all the beauties of compassion, and great polarities of opinion, all those things that sort of become the gamut of what's happening. Nothing excites me more than seeing somebody just coming upon something that they've just made, and you know they are still just as surprised, and in that sort of floating head space of wow, I just did that, that's amazing. Selections from The Caveat Onus: Complete Poem Cycle by Dave Brinks (Black Widow Press, June 2009) www.blackwidowpress.com ISBN: 978-0-9818088-4-0, 240 pages, $19.95. The author gratefully acknowledges those editors who generously featured sections of The Caveat Onus in their literary journals, magazines and anthologies: ArtVoices, Breaking Ground, Callaloo, Constance, Exquisite Corpse, Kulture Vulture, La Reata, Lungfull, New Laurel Review, New Orleans Review, Not Enough Night, Now Culture, Origin, St. Mark's Poetry Project Newsletter, Saw, State of the Union, Tool, Trumpet, Xavier Review and Yawp: a Journal of Poetry & Art. "When did the storm come?" "Did it come when you & Mommy were little?" In the interview, Peter asks me about the process of writing the final sections in each Book of The Caveat Onus. I went on to explain how I'd lay out all three previous sections of each Book on the pool table, and then grab a clipboard, and a bunch of paper, and a pen. Then procede to write the final 13 meditations (last section of each book) as fast as I could, not allowing myself to think on it, no corrections, just immediate eye to page. The point being to do it in one shot, one go-around; no corrections, no mulling over what I wrote down after it was done. Capiche.